Enjoy the beauty of Rome at your own leisure! 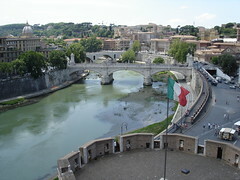 The "Roma Pass" Tourist City Card offers a variety of services and discounts which make your visit in Rome much easier. At a cost of only 23 Euros it offers services that worth over 40 Euros. The "Roma Pass" lasts 3 days after being printed. preferential access to all the visited sites and events in town. Modern travelers take the open road for granted. We can hop into exquisitely engineered modern vehicles, pop onto smooth, straight freeways, well lit, with excellent signage and many roadside conveniences. We can cover as much ground as we might like in any direction, in relative comfort and safety. Much that we love about modern road travel was actually available 2500 years ago to the ancient Romans. They created the template for a system of interconnected roads and conveniences that we have simply adapted during the 20th century as the automobile became the mass method of conveyance. The road system that they built to connect their far-flung empire is still in use in many places. The Colosseum was commissioned by the Emperor Vespasian between 70 and 72 AD and was completed in 80 AD by his son Domitian. It was built on a marshy site of a lake near the site of Nero's enormous palace. There was a colossus (a very tall statue) of Nero nearby, from which legend says the Colosseum's name was originated from, later destroyed in the great fire of Rome. The Colosseum was cleverly designed. It has been said that most today's stadiums, and structures alike have been inspired by the concepts introduced in the Colosseum's building structure, even in modern times. It could be evacuated inearly in five minutes. The most inventive part of the Colosseum was its cooling system. It was roofed using a canvas covered net-like structure made of ropes, with a hole in the center to provide a breeze for the audience. For some people, the perfect holiday might be summarized as follows: arrive at the airport, check into a luxury hotel, spend the rest of the time at the pool or the beach with the latest bestseller. That may be a good way to unwind and indulge in a bit of unstructured, do-nothing time, but it has always seemed to me to be a bit of a waste, especially when you are a foreign country. Not that I am advocating racing around museums or culturally worthy sights, especially when the weather is hot and you are faced with queues and cross children, but maybe there is a way to have the best of both worlds. In Italy, one way to experience an authentic taste of the country, its cooking and its way of life is to book yourself into an agriturismo. This roughly translates as a 'farm holiday', but the type of holiday accommodation you find can vary from the simple and rustic to a level of sophistication that's on a par with any five-star hotel. Venice is known to be expensive, but don't despair. I have created a list for you to enjoy Venice to the maximum without spending a fortune! 1) Piazza san marco is excellent place to stroll around the square. Do some window shopping, take amazing pictures of the great architecture and if you like pigeons, then join them in the middle of the square as they love to just stand on people. In this amazing world wonder city on water probably the best way to get around (if you don't want to walk a full day) is the "Vaporetto". The Vaporetto is a boat that is like a bus except it stops at a pier to pick up passengers. A one way ticket costs 6.50 euro (2008 price) each way per person for any line along the Grand Canal, valid for up 60 minutes. Before boarding a 'Vaporetto', you must stamp your ticket in a little yellow box, found on both sides of the platform. If you forget to do so, tell the guy that ties the boat to stamp it for you. By doing this, you will avoid a fine of EUR30 if you get checked by the ticket-person while in the boat. If this happens make sure the ticket-person gives you a receipt for the fine you paid. You do not have to show your ticket on board unless a ticket-person, comes on board and asks you to show it, but make sure it is stamped. If you plan on using the 'Vaporetto' often, you might want to consider purchasing a pass which end up saving you money in the end. When you get off at the Venice train station stop (Santa Lucia), walk outside and go down a long set of stairs to the boat docks. There are two "Vaporetti" main lines. You will have a choice of taking Line 1 or Line 2 to get to San Marco. Both of these lines make several stops including Rialto Bridge, but Line 2 is a much faster and preferred line. Water Taxis are fun and great for large parties of 5 to 8 people splitting the costs. This way is fast and fun, but it could be a bit expensive (approximately 100-150 euro depending on the number of people and luggage for a 20/30 minute ride into most parts of the city). If you use this taxi service in the early morning hours or very late evening, you will pay approximately 10 euro more. The best and least expensive way into Venice from Treviso Airport is to take the Ryanair Bus Shuttle service for 5 Euro per person to Piazzale Roma in Venice. From there, you can get a public "Vaporetti" along the Grand Canal. Attention: Take the bus only to Piazzale Roma. If you are driving in or have a rental car, ask your car rental company to allow you to drop off your car in the Piazzale Roma (big square on firm land) in Venice. Do not park your vehicle at the Airport location. From the airport makes the commute into the city much longer with a possibility of a higher cost. Wine lovers are also in for a treat as many great wines are found in this area. Although Chianti is not strictly on the Tuscany Umbria border it is only a short drive. houses in Tuscany and Umbria are reached along gravel roads or "strade bianche" . along them the nerves are soon overcome. Tuscany or Umbria regions of Italy. Emma Cordingley, originally from the UK has lived on the Tuscany Umbria border for 7 years with her husband and 2 daughters. 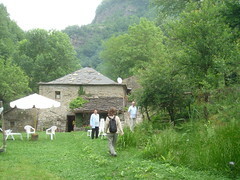 Together with her husband she runs a vacation rental agency offering villas, farmhouses and apartments for holiday rentals, http://www.tuscanyumbria.com and walking holidays; http://www.tuscanyumbriawalks.com. This is a very family friendly service and is also a very good idea to jump start your vacation and get acquainted with the city, attractions, places and distances. Just have a tour, see what Rome has to offer, get off at your favourite place if you can't resist :) or take the whole loop and carefully choose your next top attraction to visit. There are many different companies (up to 7) that operate very similar core routes around the Rome sights. Although all tours are loops where you can start at any point, nearly all operators start at Termini Station the main central station of Rome, connected to both metro lines A and B. Generally you have the choice of a 24 or 48 hours ticket with which to make use of the 12 to 20 stops in the most beautiful, cultural and evocative areas of the Eternal city. The tours operate 365 days per year. All of the buses are open-top and equipped with a personalized throwaway audio system which functions more than 8 languages languages, providing recorded commentary throughout the tour. Often there is also an English and Italian speaking host onboard each bus to assist with any queries. You will be provided with a set of earphones which you keep and use for the duration of your ticket. The itinerary usually goes from Termini Station passing the Colosseum and Roman Forum then Circus Maximus and along the River Tiber, where you can walk over to Trastevere. Then back again to the other end of the Roman Forum and then Piazza Venezia. From Piazza Venezia it stop along the way near the Piazza Navona and Pantheon and then straight to the Vatican crossing the River Tiber. After the Vatican most buses will route through the Villa Borghese, Via Vittorio Veneto, Piazza Barberini, Spanish Steps and Trevi Fountain. Then back to Termini. Check out the travel map for the specific bus operator of your choice for the detailed route. Most operators offer a discounted fare for children aged 6 to 12 years old. Roma Christiana in addition to the standard route has an extended tour that visits many Basilicas to the south of the city, Baths of Caracalla and is the only bus that visits Trastevere itself, even going up the hill behind Trastevere with great views down on the city. ArcheoBus goes through the centre of Rome and then along the famous Park of Via Appia Antica, and the Christian catacombs stopping at many of the major archaeological sites. Sarah Dudleymore is a professional travel consultant. She is working for "The Key to Italy" a travel agency specialized in Rome Apartments and Venice Apartments for Rent. Arriving in Ventimiglia, our first real stop over the border from France, (Monaco was also along the way) into Italy I was pleased to see a distinct difference between the Italian locals and the French ones I'd left behind. Admittedly there is a real sense of the Mediterranean life all the way along the Cote D'Azur, with fairly laid back individuals, all there to soak up sun and wine, but these locals appeared even more so. The Carabinieri on the platform as we pulled up were looking so relaxed as to almost appear asleep, even the sniffer dog didn't look at all bothered that 15 sweaty backpackers had just arrived. Nobody moved, no passports were checked, just a few cheery 'ciaos' and a 'benvenuti'. After leaving our bags with the guide to mind we set off to explore for an hour before catching the next train. Having already spent the better half of the previous hour practising how to order a cappuccino in Italian I was eager to try it out. We found a kerbside café and sat down. To my amazement the waiter understood my request on the first go and duly brought me the coffee. I was still grinning when we got back on the train. The journey to Cinque Terre takes you through countless tunnels, carved into the cliffs hanging out over jagged rocks and pebbly beaches. Each time we hit the darkness, the curtains flapping dementedly in the open windows, I could still see the blue water imprinted on the inside of my eyelids. Nowhere else have I experienced that effect. The locals and us were all chatting amongst ourselves until one guy asks me where we are all going in Italian. I answer Rio Maggiore. Then he asks me where we are all from. I explain that I am a tour guide and my group are all from all over the world. He is going to Calabria to see his mother and he is from Milan. He works in a factory there making cars. Another lady opens her travelling cool box to share some iced coffee in tiny plastic espresso cups with the 2 Korean girls in my group, and another one pulls out some 'dolce', sweet pastries to share with the Canadian girls. Of all my train journeys in Europe I have found the Italians to be the most generous to backpackers, in terms of communication and sharing the contents of their cooler bags. Especially on the train going to Calabria from the north. I once spent the leg between Pisa and Rome stuck in a corridor with an old guy of 60, a phrase book and a lot of sign language. He was very keen to tell me his family history and was most impressed that a kiwi from 'lontano' was trying to speak Italian. He even gave me grammar lessons and corrected my pronunciation. That never happened on a French train. More recently on the train to Florence from Pisa I sat next to a girl from Romania getting an entire itinerary of what to see and do in Florence from the guy opposite her in Italian. The interesting bit was she only spoke a few words but seemed to grasp most of what he was saying. It was great to see the passion for which he was talking about what was obviously his home town. On one trip I managed to fulfil the desires of one rather shy Chinese girl who had a thing for men in uniform. She was trying to collect as many photos of them as possible from all over Europe. Some Italian Navy boys had got on at La Spezia, obviously from the Naval base there, heading to Rome along with a couple of Air Force boys. They were filling the corridor outside the dining car, laughing and yelling, all only too willing to pose for a couple of photos with my now tomato-red-in-the-face passenger. We thought we hit the jackpot when some army boys were spotted on the platform at Ostiense in Rome, but they were waiting for another train. She got a photo through the window instead. The most frustrating time on the trains can be Florence S.M.N. The letters could easily stand for 'so many new platforms' instead of Santa Maria Novella as they have an annoying pastime of switching tracks on you. You have to listen to the announcements very carefully. They do them in both English and Italian but as soon as one train is late arriving they start shuffling the rest of the platforms like a deck of cards. With a group of 12 individuals one day we were waiting an extra 45 minutes for the train to Venice, supposedly arriving on track 11, then it was track 9, then it was back to track 11 at the very last minute. We broke the rules and ended up hurling packs across the train tracks onto the end carriage as the guard blew his whistle for the departure and we had some stragglers who hadn't heard the change walking back from the sandwich bar. Everybody made it with a sprint finish. On the contrary, in Venice the train guard was very accommodating when I had lost an American passenger between the baggage depot and the train in the short space of about 10 minutes. I explained she was late and he smiled, said ok, and waited an extra 5 minutes with me. Eventually he tapped his watch and we had to abandon her. This was the last train out of Italy to Austria that day so I wasn't sure when I'd see her again. When I eventually did she had an awesome adventure to tell, but that's entirely another story. For point to point travel you can't beat the Italian trains for good value, not just in the price because with a train ticket you get so much more than just a seat. Sometimes you don't even always get a seat, especially if it's in the middle of August, but you get a fantastic opportunity to experience the local culture that just can't be had from a guide book or the inside of a bus. Katy Hyslop is a women of action keeping Plus Villages and their staff under control. Her experience as teacher, backpacker and tour guide in Europe for the past six years enables her to have a unique view on the world of travel. If you are amongst the many cycling enthusiast heading off to enjoy the first Grand Tour of the year, the Giro d'Italia, then you might well want to consider a Tuscany villa rental for your accommodation. By placing yourself in the middle of the country, you'll be well situated to make the most of the all important middle section of the tour, as it winds its way back up the peninsula on the way to the Alps and the grand finish in Milan. The Giro is a favourite amongst cycling fans, not only because it is the first big stage race of the season, but also because it retains an atmosphere very different to its brash big brother, the Tour de France, and the Vuelta a Espana which suffers from administrative meddling. This year's edition will kick off to much fanfare on the 5th of May in Herning, Denmark. The Giro has begun outside of Italy on a number of occasions, most recently in the Netherlands in 2012, but this year's Danish start will mark the furthest north that the race has been. After three days in Denmark, the race arrives home in Italy and goes on to visit many of the mainland regions, including Tuscany. Villa rentals for bicycle racing fans should ideally be booked for the 16th and 17th of May, although basing yourself in this part of Italy for the first couple of weeks will allow you to travel off to follow the race around southern and central Italy. That said, it's wise never to expect to be able to travel easily when you're competing with the behemoth of an entourage that follows any of the grand tours. Before you book your Tuscany villa rental, it's important to consider the route of the race. The 2012 edition passes through the east and north of the region, crossing over the border after its beginning in Assisi on the 16th of May. This stage is flat and will benefit the sprinters, including world champion Mark Cavendish if he participates in the Giro this year. If you choose to head towards the end of this stage, you'll have plenty to see in the town of Montecatini Terme, which is popular with tourists throughout the year. For the next day's stage, you'll want to head to the mountains from your Tuscany villa rental. This stage is categorised as a medium mountain stage, so you're likely to see some enthralling duels between the all-rounders as they travel from Seravezza and on to Sestri Levante in the province of Genoa. There will still be plenty for the riders to compete for as they head towards the serious hills in the final part of the tour. Giovanni Balboni works for To Tuscany, who specialise in finding the perfect Tuscany villa rental in Chianti as well as selected villas in Umbria and Puglia. To Tuscany is proud of their villas and their reputation. Each Tuscany villa rental is personally selected and visited by our representatives to ensure we offer only the best in the region. You've just arrived in Rome with a couple of days to kill. How is it possible to see all there is to see in such a short time? This is the guide to get the most out of Rome in the shortest amount of time. Hopefully check in at the hotel has been fairly straightforward so now it is to venture out in search of a good meal. A meal in the old Trastevere part of the city has several benefits. Firstly there is a multitude of touristy type sidewalk restaurants and pizzerias to choose from and secondly they are within gentle strolling distance of several significant landmarks, including the well preserved Pantheon. Rome is just as appealing by night as by day, with the heat of a Roman summer, night time walks may just save a few hours of excessive sweating during the day. Any of the little back streets between the Pantheon and the Spanish steps are perfectly placed to allow a generous meal of pasta and a good carafe of wine to be walked off quite easily. Make your way to the Spanish steps to sit and hang out with the locals, while the view from the top of the steps in front of the church Trinita dei Monti offers a great view out over the city. Wander through to the Trevi Fountain and buy dessert in the form of a gelato and try your luck with the change. Throw one coin over your shoulder to come back, two coins to come back and get kissed or three coins to come back and be married. Keep on walking through the streets until you reach Piazza Venezia, so named because of the Palazzo overlooking the piazza that resembles the Doges Palace in Venice. The balcony on the second floor may look familiar, it was the podium from which the dictator 'il duce' Mussolini delivered his fascist speeches. The other landmark overlooking the piazza is the unmistakable monument to Vittorio Emanuele II. This has earned several nicknames over the years including the Wedding Cake and the Typewriter. The tomb of the Unknown Soldier lies here under armed guard along with the eternal flame. If the monument is open there is a fantastic view over the Rome rooftops, a glimpse into the Roman Forum and the Colosseum behind it. This is closed at dusk but many of the ruins are lit up at night. If the night air has revived you there is the option of checking out the local night life as there are plenty of bars and clubs open around the central city area. Also there are some in other piazzas such as Piazza Navona and Campo dei Fiori that stay open until the early hours. Otherwise it's back to the hotel to get ready for tomorrow. It pays to start early, particularly in the summer to beat the crowds and the temperatures but luckily the city is not too spread out to get from one sight to the next. The metro system is basic to use to say the least, there are only two metro lines that criss-cross the city and the buses are clearly marked with destinations. Termini is the central bus and metro terminal. Tickets must be bought before boarding and validated in the yellow machines, starting from EUR1 for one journey. No visit to Rome is complete without a trip to the Vatican. San Pietro is on the western side of the river Tiber with the dome of St Peter's visible from most parts of the city. The Vatican museum rooms are open from 8.45 in the morning until 4pm, with the last entry just before 3.30pm, during the busy summer months. It is open until 1pm on Saturdays and low season, while it is closed on Sundays and religious observances. You need plenty of time to walk through the 7km of museum rooms to reach the Sistine chapel where you can admire the detail and wonder at the creation on the ceiling by Michelangelo. It pays to have some sort of description of the frescoes handy to explain what you are looking at. The Pope gives his public address on Wednesday mornings at 11am. If you are still hungry for more there is the vast interior of the Basilica itself, the crypt below and the view from the dome above down into the square. Now is probably a good time to find some lunch before taking on the Colosseum and the Roman Forum. Take plenty of water with you in the summer months as wily vendors will sell small bottles at exorbitant prices. Along lunch also gets you out of the hottest part of the day. Entry tickets to the Colosseum can be bought at the gate but if the line is too long you can go to the ticket window at the base of the Palatine hill and buy them there. The line here is generally much shorter as not many tourists go up the hill. The remains of the Emperors palace stands at the top overlooking the forum and quite stretegically down on the Temple of the Vestal Virgins. This hill is also said to be where Romulus founded Rome. Beside the Colosseum stands the Arch of Constantine, which was an exercise in recycling of old monuments by Emperor Constantine to reward himself for beating Maxentius. The Colosseum has been damaged over the last 1800 years by earthquakes, invaders and marble merchants but the recent restoration projects has seen parts of it restored to give a good idea of its original state. The Via Sacre leads from the Colosseum up into the Foro Romano, the centre of the ancient Roman trading world. The ruins include the original forum, Julius Caesar's funeral pyre, his Senate building, the Temple of the Vestal Virgins and the arch of Septimus Severus. The forum was buried over several hundreds of years of flooding, each layer has been stripped back to reveal another Roman era, and in some cases where two eras have merged, as in the case of the Temple of Antonino and Faustina. The door that stands halfway up the exposed wall shows where the ground level was during the 8th Century when the 2nd Century temple was converted to church. There are plenty of tour guides available as history students and licensed guides offer their services with tours of the forum and the coliseum. The stories they tell really help the ruins to come alive. Across the road is Trajan's Forum with the very conspicuous Trajan's column. This marks the edge of ancient Rome and the continuation of the modern city. Unfortunately most of ancient Rome lies beneath the Via dei Fiori Imperiali, the road built by Mussolini to parade his troops up and down before going off to battle. The rest of the day can be spent either indulging in some people watching at any of the cafes in Piazza Navona and admiring the Fontana dei Quattro Fiumi sculptured by Bernini, or relaxing in the shade in the park at the 17thC Villa Borghese. Then its back to those clubs you missed last night. This really depends on when you decide to leave. An early evening departure may enable you to take in one of three options provided you start early. The baths of Caracalla is a 10 hectare space that once held 1600 people there to take advantage of the bathing, shops, libraries, gardens and public entertainment. These open at 9am closing 1 hour before sunset and 2pm on a Monday. You would need around 3-4 hours including travel time to view these. The other option is to visit one of the vast catacombs that are buried beneath the city. These are miles and miles of tunnels, burial vaults and Churches dug by the early Christians to escape persecution by the Romans. The burial vaults are countless metres tall and the tunnels run down over several levels. The resulting rabbit warren requires a guide to take you through and out again safely. You can choose from the ones on the Via Appia Antica, which are the largest, or the Catacombs of San Callisto which are next door to the Catacombs of San Sebastiano. They open at 8.30am closing at noon, reopening in the afternoon from 2.30pm until 5pm. Again you would need 3-4 hours to take one site in. The third and final choice is to leave the whole touristy thing out and indulge in some authentic food experiences. The food markets north of the Vatican are held just off Viale dele Millizie and the ones in Piazza Vittorio Emanuele near Termini offer a selection of fresh and locally made produce. There you have it, all the major attractions of Rome achievable in just 2 days. The choice now is, do I really want to leave just yet? Katy Hyslop has spent the past 6 years travelling, tour guiding and generally hanging around the European tourism industry. She is now based in Italy and in charge of keeping the crew under control at Plus. 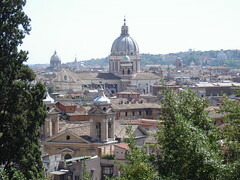 If you want to know more on what to see or where to stay in Rome click here [http://www.plusvillages.com/HostelsInRome.aspx]. France is a country with a fierce and iconic reputation for fine food. It has long been the breeding ground for some of the world's top chefs, and constantly raises the bar when it comes to gastronomy and culinary innovation. One of Frances most famous and exquisite exports is its French Cheese. This article will at five of Frances finest cheese, so pour yourself a glass of wine and prepare to have your taste buds teased. First up we have Bleu du Bocage, a wonderful blue cheese made from goats milk. Each wheel is aged for about three months before it is ready for consumption. It has a moist and creamy texture, and the blue/grey veins that run through it give this cheese a beautiful appearance. This is a cheese that perfectly combines the grassy flavours of the rind with sweet fruity flavours and a peppery kick. The Bleu du Bocage is best served with preserved walnuts and a glass of fine port. Next up we have a fine Brie, Brillat Savarin. Be warned, this is not the healthiest of cheeses, but it is the most delicious Brie available. Brillat Savarin is a Brie with cream added to it, this gives it the most rich and creamy texture you could imagine. For the best tasting Brillat Savarin, look for the ones aged by Maison Mons. A personal favourite and cheese board classic is the St Felicien Mons. The St Felicien Mons is a soft and mellow cheese with a buttery flavour. It is named after the small Alpine town from which is was first produce. This is a great all-rounder that can be enjoyed within a well made sandwich, on some high quality crackers, or simply by itself and a nice glass of red wine. A great and extremely affordable cheese is the Roi de Trefle Camembert, available from Aldi. Although you can purchase this cheese from Aldi, this is fabulous cheese still holds its own against the rest on this list. This is an utterly irresistible soft and creamy cheese, a sure fire winner for all cheese connoisseurs. Last but not least we have Roquefort, a true French Classic. This sheeps milk cheese is the world's best known blue cheese. Roquefort is a tangy, slightly moist and crumbly cheese, with distinctive green veins that run throughout. It has a tangy and sharp initial taste due to the green mould veins, from there the taste gets mild with sweet and smoky bursts, with a salty finish. 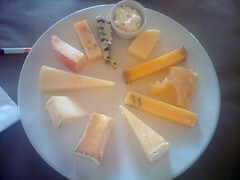 French cheese a lot like many French produce, is a delicacy. Each region and village has something new and exciting to offer. For the best French cheese you really can't beat the stuff you will get in these French villages. Saying that, with the ever growing popularity and awareness in Britain towards fine food and fresh produce, many supermarkets are filling their shelves with more and more exciting foods. Where as in the past you may have had to visit a specialised cheese monger for quality French cheese, you can now purchase cheese online from most major supermarkets. Charlie Taylor is a cheese monger from Scotland who runs and online cheese shop. When hes not distributing cheese throughout the UK, he likes to write about cheese online! Italian cuisine is one of the most popular culinary art forms in the world. These flavourful dishes have often graced the tables of many homes and restaurants all over the world. Naturally, the best place to sample authentic Italian cuisine is in Italy and a holiday to the country will not be complete without sampling some of the best dishes in the region. 1. Pizza - This is a contemporary Italian dish that was invented out of necessity in times of war, where Italian peasants would bake whatever vegetables and bits of meat they had on a piece of dough. Today, this popular dish has made its way all over the world but is at its best in Italy. 2. Lasagna - This is a classic Italian dish. Usually, ground beef, an assortment of cheeses and some sausages are used in making lasagna. Some lasagna dishes are prepared using tomato sauce in a process very similar to preparing spaghetti with tomato sauce. 3. Chicken Parmigiana - This is another classic Italian dish. It is similar to a sandwich and can be made by deep frying pieces of bead and chicken topped with melted cheese. 4. Linguini - Italians make the best linguini and this dish is served with a clam sauce made out of fresh clams, garlic and olive oil. 5. Fettuccine Alfredo - Fettuccine are long, wide noodles and aflredo is a type of white cream sauce. The heavy white sauce does a good job of sticking to the fettuccine resulting in a creamy and flavourful pasta dish. This is popular dish with both locals and tourists. 6. Pasta Primavera - This is a vegetarian pasta dish usually prepared with springtime vegetables. Although authentic pasta primavera is usually vegetarian, there are some variants that use shrimp or meat. 7. Veal Marsala - This dish is composed of veal cooked in Marsala wine sauce. This delicious dish is usually served with scallions and mushrooms. 8. Shrimp fra Diavolo - This is a spicy dish aptly named. Diavolo is the Italian word for devil and this dish is prepared with a lot of crushed pepper. This dish is rather spicy but is extremely delicious. 9. Chicken Saltimbocca - This is usually made with chicken, mozzarella cheese, spinach, and prosciutto ham. 10. Spaghetti Bolognaise - This is a classic Italian dish and it is one of the most popular and recognisable Italian dishes in the world. This is a simple and affordable dish made out of spaghetti noodles, tomatoes, beef and an assortment of other ingredients. Most Spaghetti dishes are prepared with ground beef, meatballs, mushrooms, broccoli and an assortment of sausages. Orson Johnson writes for Holiday Velvet, a website providing Self Catering holidays in Italy & Food holidays in Italy. The Amalfi Coast is a 43-mile stretch of coastline on the southern side of the headland that reaches out towards Capri. Stretching from just west of the town of Salerno to the "pearl of the Divine Coast" Positano, the Amalfi is known for its steep coastline, with cliffs and ravines that plunge to sea level and the beautiful sandy beaches that have been attracting tourists for decades. The region is also well-known for some its culinary delicacies, and many of the pretty historic villages in the area have their own speciality. Positano is probably the most famous of the resorts on the Amalfi Coast, celebrated in literature as well as by the millions of visitors who have enjoyed its charms. Although the beach is the main attraction, it is worth exploring the historic town, with its maze of narrow, winding streets, full of shops selling locally made items, such as the linen dresses that are typical of the region and, of course, the delicious local liqueur, limoncello. There are several churches to visit, for such a small town, as well as the fortified towers that formed part of an elaborate coastal defence against pirate attacks. The Grotta La Porta, a cave in the cliffs will keep the kids happy too. You can take boat trips along the coast from the marina at Positano, and enjoy the view of the three rocky islands that rise from the sea three miles off the coast, Gallo Lungo, Rotonda and Castelluccio. Bucharest Film Festival from the 19th to the 25th of March 2012: The Bucharest film festival, which was born in 2005, is going to be inaugurated, and the Rumanian capital city is ready to turn into the European capital city of cinema, at least for a few days, and to welcome film lovers coming from all over the country, and beyond. As far as tradition and renown are concerned this film festival is no match for other European events that are now become part of the cinema history, like Venice, Cannes and Berlin, but in spite of its being very young, the Bucharest festival had gained a place in the sun among the most appreciated film festivals of the old continent. For more information, please visit studio flat for rent , holiday studios or tourist lodging . You have just arrived in the Renaissance capital of the art world with a couple of days to spare, so where do you go and what highlights can you see in such a short time? This is the guide for you to get the maximum out of a short stay in Florence. Now is probably a good time to familiarise yourself with the central city, if it's late summer it will be beginning to cool down and hopefully the crush of the tourist crowds will be starting to diminish. The centre of Florence is easy to walk around as the streets are narrow and most are closed to traffic. Starting off around the main station there is the Piazza Santa Maria Novella with the church that gives the train station its name. Opposite the church there is the Piazza Nazionale and a road which leads down to the Piazza del Mercato Centrale. Here there are a few market stalls selling leather goods, souvenirs and other items. The 2 famous buildings to see here are the Cappelle Medici and the San Lorenzo e Biblioteca Laurenziana. You will see the Duomo before you reach the piazza it resides in as you walk down Via Borgo San Lorenzo. The squat building in front of the cathedral is the Baptistery, built on the foundations of a Roman temple. The golden doors facing the cathedral are replicas of an original set made by Lorenzo Ghiberti and regarded by Michelangelo as the "doors to paradise". But the sight most visitors are bowled over by is Brunelleschi's dome, the cap on the already impressive Chiesa Santa Maria del Fiori. Standing guard beside it is the campanile, or bell tower built by Giotto. Rome is a must-see destination on any European holiday. It has a rich mix of history, art, culture and architecture. Experiencing where the gladiators fought in the Roman Coliseum, the great architectural marvel of the Pantheon or the sublime beauty of the Trevi Fountain will take up a lot of your time in Rome, but you'll need somewhere to eat and relax as well. Many people enjoy Italian food at home; nevertheless experiencing Italian food in Italy's capital city is a must-do on any trip to Rome. A truly multi-faceted land, Italy has seen a remarkable growth in tourism. Here is a list of ten hot-spots that you just cannot afford to ignore! 1. The Roman Coliseum - One of the first Roman Amphitheatres which was inaugurated after the death Vespasian in 79AD by his son Titus, the Roman Coliseum has witnessed innumerable historical gladiatorial shows of death and violence. With a capacity of 50,000, this overwhelming historical monument is a must-see in Rome, Italy. 2. The Leaning Tower of Pisa - This marvellous work of art which started in the 12th century and took around 177 years to be completed needs no introduction. One of the third oldest structures in Pisa's Cathedral Square, the tower leans at an angle of 3.97 degrees to the southwest and remains one of the most fascinating pieces of architecture to this day. 3. La Scala, Milan - While it is a known fact that opera is at the heart of Italian culture, the La Scala Opera House is one among the most famous theatres in the world. Inaugurated on 3 August 1778, this is one place an admirer of art and opera cannot afford to miss out on while in Italy. Your trip to Italy should be a memorable one and therefore must be programmed carefully. Before booking your flight and accommodation, read and find out more about the areas, famous places or most popular neighbourhoods in Rome. ... grew in the middle ages with narrow, winding, irregular streets. There was no space for carriages to pass, therefore Trastevere remained a maze of narrow streets what is known today. All year round the Trastevere area is a major attraction for its restaurants, cabaret clubs, movie theaters, crafts artisans and picturesque maze of narrow cobbled alleyways. During the evenings, cafè and restaurants tables spill out over to the pavement, one area in particular is around Piazza Santa Maria in Trastevere. During the morning hours, this friendly neighborhood of antique charm and unique narrow alleyways of Trastevere is better appreciated. ... in Italian means "Scalinata". They can be easily found and recognized by a rectangle like shape and an early Baroque water fountain called "La Fontana della Barcaccia" ("Fountain of the Old Boat"), built in 1627-29 at the foot of the stairs. It is without a doubt the longest and widest staircase in all Europe; one of the most popular and famous places in Rome. Nowadays, the Spanish Steps area has become a meeting point and also an attraction if you want to take a romantic or scenic ride in a carriage pulled by a horse around Rome. Rome thrives on outdoor life. Naturally, it is obvious that Rome has a lot of museums, restaurants as well as churches, theaters and many other kinds of indoor activates. But the places to see Rome that really shine are the many piazzas. "Piazza" can be translated to mean public square. But the piazzas of Rome are unique from other famous cities because they are genuine places for lovers of outdoor art to gather and enjoy such beauty together. Probably the finest location of Bernini's "Fountain of the Four Rivers" can be found at Navona. Four striking sculptures that Bernini's students executed are artistically arranged around a rocky mass at the center of the fountain which holds up an obelisk.. One of those stunning sculptures named "the Ganges" was created by Claude Poussin who went on to become a well known master as well. The picturesque and genuine harbour is located directly at the Mediterranean Sea, 45 km south of Rome and free of mass tourism. The culture and the history of the region, the nature and the typical Italian way of life invite the visitor to enjoy "la dolce vita" atmosphere and sea life. In recent times, the Allies landed on its shores during World War II, and the American Monumental War Cemetery is not to be missed. In ancient times, Emperor Nerone chose it as the site for the Complex of the Imperial Palace and the Roman Theatre. The Roman Port and the Grotto of Emperor Nerone represent two more salient features of the town. By day time, the town lazily lies in the sun along its beautiful sandy beaches (both free or equipped with parasols, sun beds, restaurants, snack bars) and is an ideal sea life resort. At night has a very lively night life with many open air restaurants, pubs and genuine pizza houses all over town and along sea shore offering exquisite Italian cuisine, wines and day-fresh sea foods. The region has a mild climate. The summers are sunny, dry and temperate with refreshing soft winds coming from the sea , the warm water enables swimming from May to October.